The MGM Grand, which stands pride of place in the heart of the iconic Las Vegas Strip is the largest single hotel in the United States of America with its 5124 rooms. 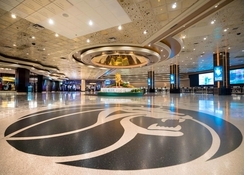 A hotel so revered it has become a landmark, MGM Grand Las Vegas comprises 30 floors, five outdoor pools, the Grand Garden Arena and a vast area to home its own famed shopping, dining and entertainment facilities, not least its huge in-house Casino. The art-deco influenced guestrooms incorporate plush fabrics, polished woods and glamorously appointed furnishings, complemented by photographs that showcase MGM studio’s film stars in casual settings within the main corridor of each guest floor. The spectacular Grand Pool complex offers guests the unbeatable opportunity to indulge in 6.6 acres of tropical bliss, with the five swimming pools surrounded by waterfalls and lush foliage, three whirlpools, and a lazy river. MGM's Grand Spa features everything from luxurious facials and nail services to soothing massages and body wraps, while a star-studded entertainment bill features world-class acts performing for your pleasure. 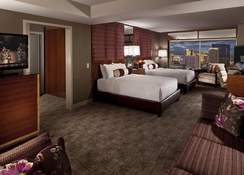 If you're going to book a Las Vegas holiday, MGM Grand is the ultimate hotel to experience it to the fullest. MGM Grand is located in the Las Vegas Strip, making it perfect for those who wish to experience everything Las Vegas has to offer more easily. The nearest airport is McCarran International Airport is only 2.2 miles from MGM Grand. 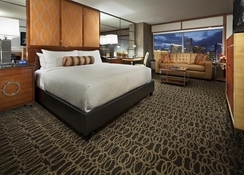 The MGM Grand comprises of an incredible 5124 rooms – more than any other hotel in the United States. Nevertheless, the resort has paid attention to detail in ensuring you enjoy a comfortable stay with sleek furnishings, glass-topped desks and marble-floor, bathrooms, roman bathtubs and separate living areas all featured. Some wellness-themed rooms feature air purification systems, aromatherapy diffusers and access to a special lounge, while a resort fee includes Wi-Fi and access to a workout room. 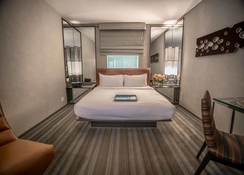 Room configurations include Grand King, Grand Queen, Grand Queen strip view, Stay-well Grand King, Executive King Suite, Stay-well Executive King Suite, Tower Spa Suite, Executive Queen Suite, Penthouse City View Suites, Sky-lofts with two bedrooms and more. MGM Grand offers a fantastic array of cuisine across 17 restaurants offering everything from on-the-run bits, casual eateries and upscale dining. Famed across Las Vegas, Morimoto's American-Japanese fare, Tom Colicchio Craftsteak and Joel Robuchon's French fare will have your tastebuds tingling, while Emeril's New Orleans' fish house and Cantonese Hakkasan restaurant ensure a spoiling of choices alongside more casual options as Michael Mina's Pub, Hecho Mexican Grill and Taps Sports Bar. MGM Grand is world famous for its entertainment options. Joint the party at Wet Republic and savour your favourite cocktails at Losers Bar or head to Hakkasan, the hotel’s nightclub for headline shows from world famous DJ acts, including Calvin Harris. Whiskey Down has an impressive selection of spirits, while Topgolf is a new and innovative game parlour, where you can play interactive games of golf. The hotel has five outdoor pools where you can relax and enjoy the Vegas sun. The hotel’s showcase piece is, of course, the casino, where one can play all manner of roulette games, slot games and poker games across its vast 17,500sq.ft of space. From March 1, 2018 the resort fees will be increased.